Colca Valley with the deepest Canyon in the world and Cusco, covering the Sacred Valley, Cusco, Machu Picchu, group tour in just 10 days. Day 2- Fly to Arequipa: Transfer to the Airport for your flight to Arequipa (2335 m.s.l). After your arrival in Arequipa our staff will transfer you to the hotel in the white city of Arequipa. Day 3- Colca Valley: Early in the morning by tours bus to the north part of Arequipa passing the town of Yura around of Mountain of Chachani, here you have a chance to see the Pampas Canahuas the National Reserve of Vicuna, at the midday arrive to Chivay at the Colca Valley for lunch (lunch on own) after you will visit the Hot Springs of La Calera, then return to the Colca Lodge for a folk show dinner. Day 4- Colca Valley – Arequipa: This morning after a hearty and leisurely breakfast we drive a short distance down the side of the Colca Canyon reputed to be the deepest canyon in the world, past megalithic ancient terracing, to Cruz del Condor. Day 5- Fly to Cusco: After breakfast our staff will transfer you to the airport for your departing flight to the Capital of the Inca. Upon your Arrival in Cusco, the ancient capital of the Incas, we greet you at the airport and transfer you to the hotel following brief orientation and a cup of traditional coca tea to assist in the acclimation to the 11300 ft. in the Inca Capital of Cusco. Day 6- Sacred Valley: After breakfast we travel by bus through the Sacred Valley of the Inca. where life has remained almost unchanged for 500 years. Upon decent into the Sacred Valley you will know that you’ve arrived in the area the Inca revered for its lush fertile soils. The scenery is unsurpassable, close and distant snow peaks glistening in the Sun. Later on, you will have the opportunity of visiting the lively local Ancient Pisac market where many of the local Indians sell their hand made textiles. It is here that many fine Andean garments are for sale and you can test your haggling powers as you bargain for trinkets and souvenirs. For lunch you will have the chance to eat a buffet lunch at the local hacienda restaurant with traditional Andean foods and music. Day 7: Cusco – Machu Picchu: Early in the morning after breakfast we aboard the tourist class train to Machu Picchu. The 3 hour train for one of the world’s great railway journeys. This climbs out of Cusco on an amazing switchback track, passes through picturesque Andean scenery, traditional villages, Inca ruins and rushing rivers. Day 8: Machu Picchu – Cusco: It is said that Machu Picchu is a place of great spirituality, and the best time of the day to sense this is at sunrise. Early risers may walk through Machu Picchu in the mist to explore the ruins without crowds. 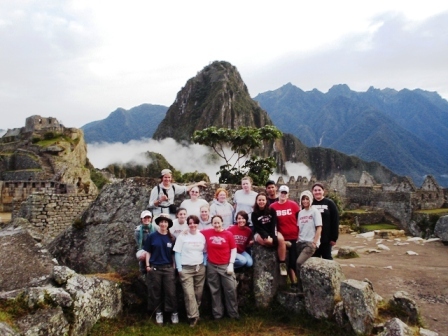 We’ll take the 20 minute bus ride up to Machu Picchu, perched 600 meters above the river. Our guide will explain the history and the myths that surround this archeological wonder. Machu Picchu, the famous lost city of the Inca is one of the most magical and mysterious places on Earth! Stand 2,430m above sea-level in the middle of a tropical mountain forest. In an extraordinarily beautiful setting, it was probably most amazing urban creation of the Inca Empire at its height, its giant walls, terraces and ramps seen as, if they have been cut naturally in the continuous rock escarpments. Day 10: Lima: After breakfast transfer to the airport for flight back to Lima and for our international flight. Etiquetado Arequipa, Colca Canyon, colca valley, escorted group tours, tailor made tours.